The following list includes various talks and workshops on the related field. Workshop: Intro to Arabic Typography & Cultural Symbols, American University of Kuwait (AUK), 2018. This workshop allowed participants to have a thorough understanding of the difference between Arabic calligraphy and typography. It allowed learners to distinguish between writing, lettering and/or designing for type design. Participants gained the knowledge and skills needed to help understand the progressive transitional phase of a calligraphic practice to a typographic one. This was achieved by understanding how to develop Arabic letters from calligraphic sketches to typographic letterforms. Starting with the exploration of two known case studies to the use of different graphic design elements and techniques, participants were aware of how to develop effective and visual appealing symbols and practice arranging bilingual texts in complete harmony. Whether to gear up a personal project with the use of bilingual texts, to the creation of cultural symbols, or the fusion of both - this workshop helped explore a broad range of typographic and design techniques and elements. This was achieved to help rebrand an existing logo, a company’s identity, or establish a new design project. At the end of the session, participants expanded their understanding of how to overcome certain challenges encountered in the process of executing simple and creative symbols as well as bilingual design related projects.. 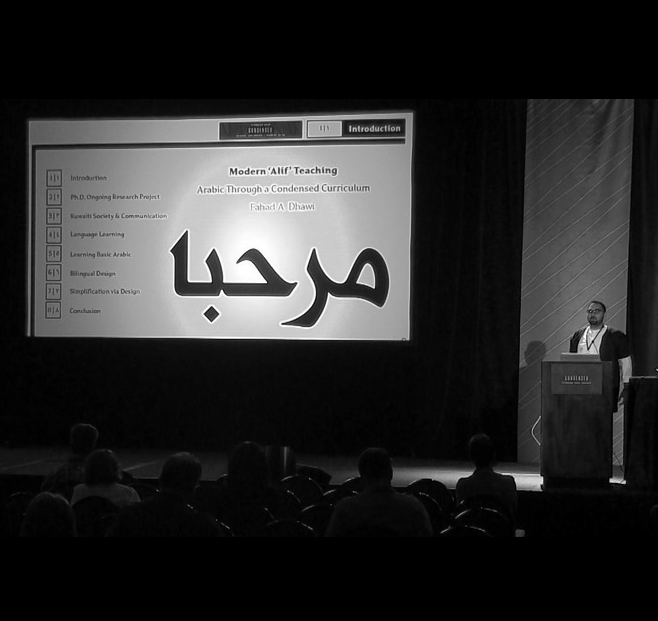 The talk discussed the rich history and evolution of the Arabic script from a typo-calligraphic perspective. It later highlighted the meaning of symbols in Kuwaiti culture and how such symbols can be merged with Arabic and Latin scripts to create effective bilingual communication design. The talk also shed the light on how a culture can be learned through the process of designing for social engagement and interaction. Te importance of symbols, including language, within a culture to identify and communicate the values and expectations of members of the community was also considered. Later on, the audience looked closely at an extensive variety of Arabic typefaces and cultural symbols that have been created and used worldwide either in museums, malls, restaurants, and other indoor and outdoor areas. Talk: Bilingual Signage & Cultural Symbols via EGD, The Seen Conference, Gust University, Kuwait, 2018. Lately, Kuwait has witnessed multiple highway transformations and infrastructure projects that are planned to handle the increasing population and all the traffic demands. Driving nowadays can extremely be challenging for tourists, citizens and residents who are suddenly exposed to all the new various diversions and roads. New innovative places, landmarks, shops, parks, malls and buildings are either under construction or in development. Therefore several question arise: is it the time for graphic environmental design to step in? Is it the time for a more accessible bilingual road signage system to replace the current one? Since graphic symbols are intended to act as a medium of human interaction, what kind of sign system should be implemented? 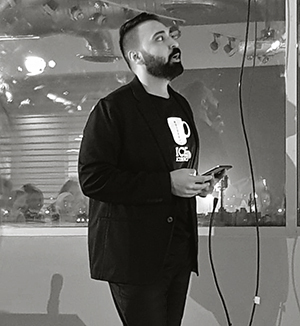 This talk discussed the important role of Environmental Graphic Design (EGD) and its necessity in Kuwait. EDG is a design profession that merges the existing boundaries between architecture, interior design, graphic design, sign systems, public art and advertising. The workshop helped registered participants understand how to break down complex texts through information design techniques to communicate simply and creatively using 'concept mapping’. 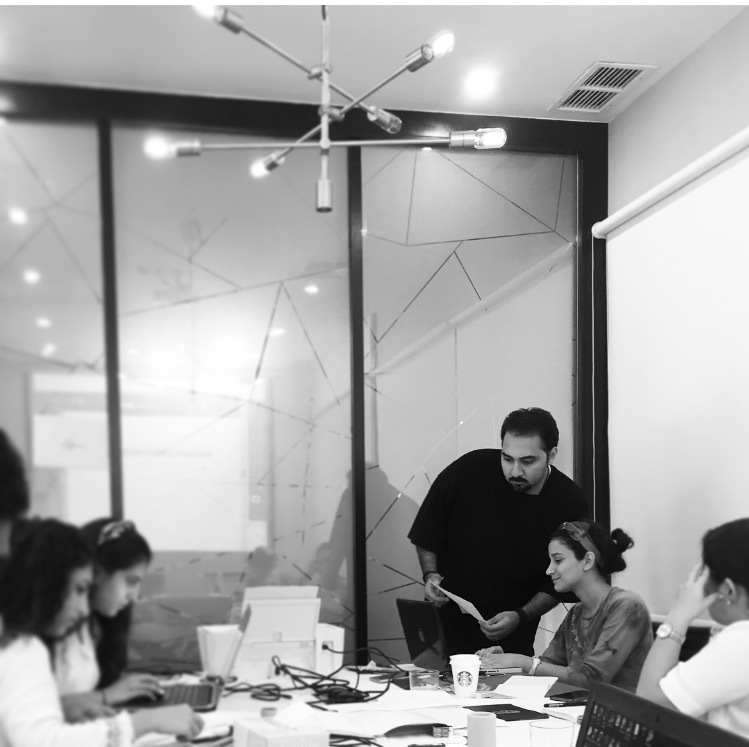 Participants reviewed an excessive amount of existing mapping visuals to understand how designers communicate clear information through simple and creative illustrations, charts and diagrams. They were exposed to a large amount of data while learning how to intake, engage, organize, summarize and arrange such information and interpret it into your own understanding through design-related strategies and graphical representations. The session helped the majority of participants develop efficient mapping skills to simplify communication and hence document and store data creatively and efficiently. The workshop helped registered participants expand their understanding of branding, designing and advertising for business projects. The session discussed the significant role of graphic communication and guided participants through the basic steps of creating great creative logo designs, package designs, corporate identities and other different types of media. They have learnt how to start a creative and a dynamic design project that focuses on both the aesthetic and functional concerns for effective communication, advertising and marketing purposes. The workshop helped them explore a broad range of design techniques and elements. Starting with understanding the ‘Harmonization’ of Arabic and Latin (English) scripts through bilingual typefaces to the use of different graphic design elements and techniques - including balance, sketching, choice of typefaces, colors, size, shape, weight, texture, value, lines, contrast, text arrangements, paper quality and the selection of appealing visuals. Participants were guided through an extensive variety of design-based theories and contextual literature to help them build their on-going projects or assist them in establishing their futuristic design projects with a clear focus and a design-related strategic framework. The one-day workshop was for people who find Arabic complex to learn and understand or in great need to improve their basic Arabic skills. It gave participants an opportunity to explore and learn the language through typography and graphic communication design. An experimental approach to learn basic Arabic through typography & graphic communication design - for beginners. The five-day workshop was for people who find Arabic complex to learn and understand or in great need to improve their basic Arabic skills. It gave participants an opportunity to explore and learn the language through typography and graphic communication design. This workshop is part of an ongoing practice-based research project carried by Fahad A. Dhawi, Ph.D. graduate from Central Saint Martins, London. The aim of the workshop is to measure the accessibility of the developed teaching-learning tools. 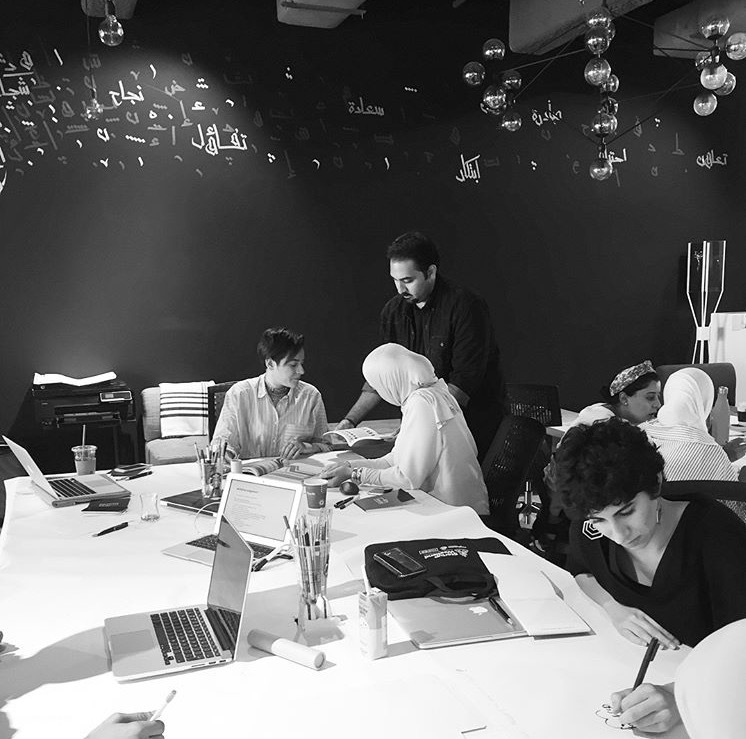 This is to assess a new creative pedagogic system that has been developed considerably with Arabic typography, graphic and bilingual communication design. Day 5: Final test level: class activities, final assessment and evaluation unit. This session focused on ways to collaboratively fight illiteracy in the Middle East using ‘Type and Design’ or, in other words, Arabic Typography and Graphic Communication. This is to help attract Arabic and non-Arabic speakers to learn and communicate in Arabic. Since globalization produced a modern Arab generation that prefers a ‘condensed’ communicative tool, Dhawi explained how ‘simplification’ can be a creative and an effective teaching-learning method for Arabic.